Guinea pigs (aka cavies) are not for people who have trouble making up their minds. That’s because they come in such a wonderful array of colours, markings and hair lengths. 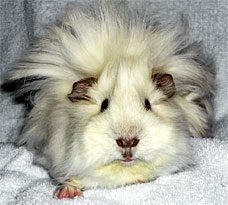 Here’s a hint that might eliminate a few choices: long-haired guinea pigs need daily grooming. Native to the Andes Mountains in South America and related to chinchillas and porcupines, guinea pigs are further distinguished by the lack of a tail and their reluctance to bite. Females – called sows, the males are boars – make do with one pair of mammary glands and experience a longer gestation period than other rodents, some 62-72 days. Litters generally number two to four with the piglets being born completely developed with a full coat of hair and eyes open and curious. You can start feeding them solid food within several days and wean them when two to three weeks old. They live on average about five years. Fussy eaters – Did you know you have something in common with guinea pigs, aside from also being really cute? They’re the only animal species, except for humans, who need Vitamin C as part of their normal diet. 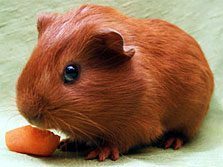 Other animals produce a special enzyme (L-gluonolactone oxidase) which, in turn, helps them make Vitamin C. So what you feed your guinea pig becomes even more critical. Fortunately, proper feeding is not that hard. You should also add variety. Not only will fruit and vegetables make your pet healthy, they also make guinea pigs happy. So don’t be surprised if yours starts excitedly squeaking and scampering all around the cage. Spinach, tomatoes and oranges usually go down very well with guinea pigs, but that’s hardly the limit of what they’ll happily munch. However, because their taste buds seem as varied as their appearances, you’ll probably have to do a little experimenting to find out just what makes your pet salivate. You should also provide plenty of pasture hay or chaff to round out his or her diet. Because lucerne hay has dangerously high levels of calcium and a lack of fibre, it’s a poor substitute. If you can, put the hay in a little hayrack attached to a wall of the cage. The importance of Vitamin C – If you’ve read about sailors a few hundred years ago (or saw Master and Commander: The Far Side of the World), you’ve probably heard of scurvy. It’s what happens when people don’t get enough Vitamin C (ascorbic acid). And it’s what can happen to your guinea pig too. Within about two weeks such a deficiency will cause your pet to become lethargic and weak. It will start eating less and losing weight. Its limb joints may become enlarged and the hair rough. In time it develops diarrhoea and a discharge from the nose and eyes. Death usually occurs within three to four weeks. 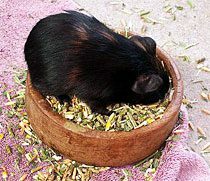 So in addition to guinea pig pellets, you should supplement your guinea pig’s diet with foods rich in Vitamin C. Good sources include dandelion greens (wash them first), capsicums, tomatoes, spinach, asparagus, brussels sprouts, kale, carrots and baby carrots, parsley, broccoli leaves and florets, cauliflower and strawberries. Oranges and cabbage also contain Vitamin C, but only a quarter as much as dandelion greens or brussel sprouts. You can also add Vitamin C to your pet’s water. Liquid paediatric Vitamin C is a good source and may be given at 10 mg per litre of water, increasing the dosage to 30 mg per litre for pregnant pets. Naturally, you should change the water daily. The real reason they’re called pigs – When it comes to table manners, guinea pigs are total slobs. Somewhere along the evolutionary line, some guinea pig parents must have forgotten to teach their young etiquette and as a result they think nothing of pushing their bedding into their food. Or their food into their water. Or their water into their bedding. To demonstrate their total lack of propriety, they will frequently soil their food, water and/or bedding. And you know what that means? You have to clean their food and water containers then restock them every day. Good thing they’re so cute. 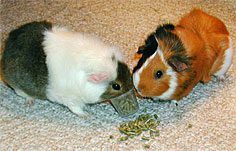 One way to keep your guinea pig’s food and water containers uncontaminated is by suspending them above the floor of the cage. If this isn’t an option, you could use something heavy to hold their food and water so at least they can’t be overturned. The water bottles sold in pet shops are hygenic enough. Trouble is, guinea pigs have this habit of blocking the ends of the tube with a slurry of food and water as they drink. So if you do use these bottles, it’s especially important to check them daily. To learn more about rodents in general, just click Rodents.